Arizona Naturalist >>> Sycamore Gallery Arthropods >>> Diptera >>> Mallophora sp. Observed along a trail at Page Springs adjacent to Oak Creek, Yavapai Co., Arizona, USA. 21 Aug. 2011. It has taken a honey bee as prey. Like a wolf in sheep's clothing, these predatory flies look for all the world like a docile, but well defended bumblebee. In this way they gain a double advantage. Birds and lizards hesitate to snap them up as prey for fear of being stung. Then bees and flies give them little heed, because bumblebees' interest normally includes just nectar and pollen. The proboscis of this fly is fashioned into a sharp beak and the tarsal claws at the ends of all six legs are designed for grasping tightly. Strong flight muscles and acute vision provide quick and agile maneuvers. 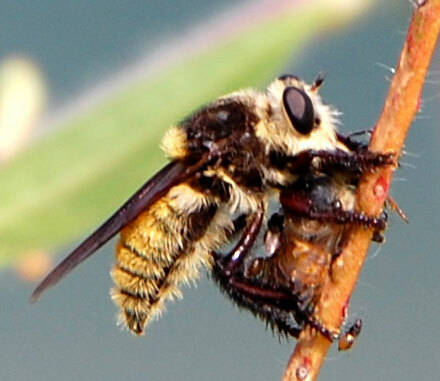 Thus, like many robber fly species, bee killers are top aerial predators in the insect world suggesting miniature versions of our familiar hawks and eagles. There really should be a sports team somewhere called the "Asilids!"